Mikala Dwyer A weight of maybes 2017. Installation view, Australian Centre for Contemporary Art, Melbourne. Courtesy the artist and Roslyn Oxley9 Gallery, Sydney. Photograph Andrew Curtis. 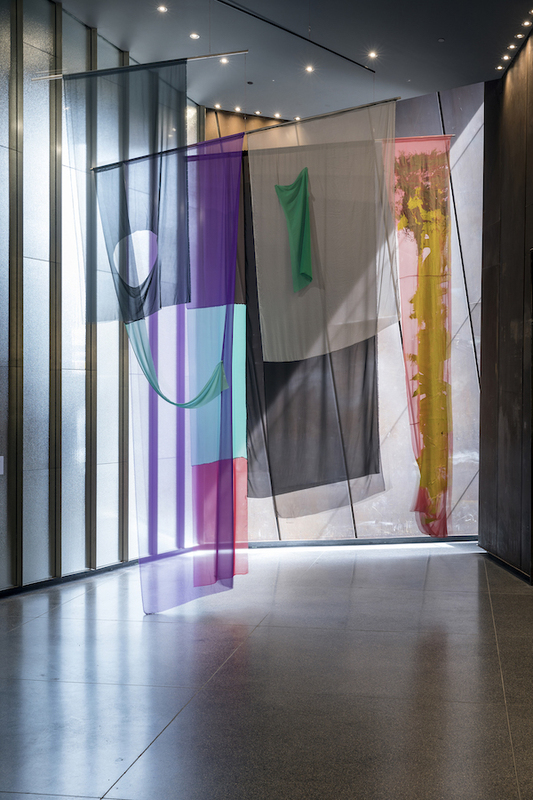 Commissioned for the grand space of the Govett-Brewster Art Gallery/Len Lye Centre’s ramp foyer, Mikala Dwyer’s sculptural installation greets visitors on their entrance into the building. With Earthcraft, Dwyer stages a series of encounters that challenge us to explore our own understanding and experience of sculpture. A series of geometric objects fabricated in mirrored stainless steel are contrasted with more eccentric forms made from fabric, ready-mades and transparent plastic. Hanging like pendulums, we are invited to wander around the sculptures as they slowly move in space, sometimes obstructing or distorting and reflecting the interior architecture, other objects and ourselves.